Punctuated with ultra-modern cut-out details, this Chantel Collar Necklace will easily spotlight luminescence in your looks. The gold-tone necklace is secured with lobster clasp fastening. 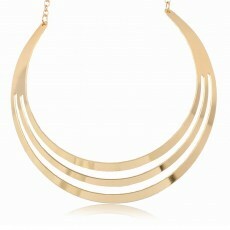 Buy this collar necklace at Oz Bling to experience a hassle-free shopping.